Dakota Dental Health Center provides root canal treatments in Minot, ND. Call 701-852-4755 to learn more and schedule your appointment. For teeth that are badly decayed or damaged, root canal treatment is often the best choice. Although this procedure is commonly feared, modern treatment techniques ensure that root canals are virtually pain-free. Here is what you should know. Each tooth contains one to four root canals. 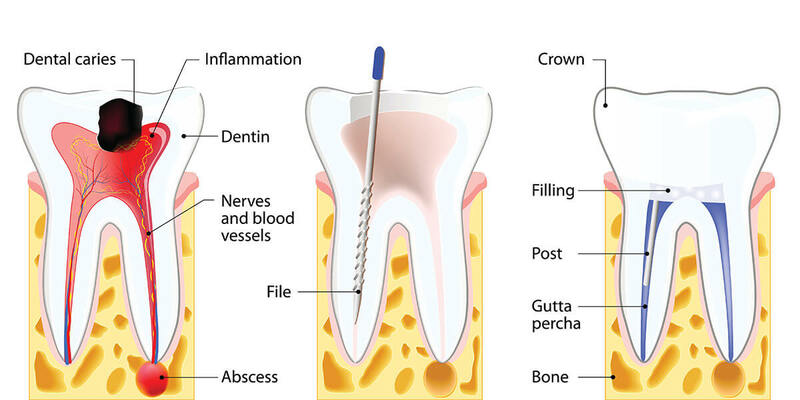 Each canal is filled with a mix of nerves, blood vessels, and connective tissue known as tooth pulp. Depending on your needs, we can treat one, some, or all canals in a single procedure. After thoroughly numbing the tooth and surrounding tissues with local anesthetic, we will drill a small hole through the tooth’s crown into its root chamber, exposing the canals. We will then remove all the infected or damaged tissue, and use files to gently reshape the canal. If needed, we will insert a post to support the remaining tooth structure. Then, we will seal the canal with a biocompatible material. Finally, we will place a temporary crown for you to wear until your final, customized crown is ready. If the tooth is not treated, it might develop an abscess. Symptoms of an abscess include bleeding, severe swelling, and intense pain. The tooth will continue to worsen, and the infection can spread to the jawbone. Over time, you might even develop a systemic illness throughout your body. Unfortunately, there is no alternative to a root canal other than extracting the tooth. While modern dental restorations are an excellent choice for replacing teeth that cannot be saved, they are no substitute for your own teeth. If a tooth can be saved with a root canal, it should be. Despite their fearsome reputation, root canals are no more difficult or painful than any other dental procedure. In fact, since badly decayed teeth often cause severe pain, many people feel significantly better as soon as the root canal is done. It is normal to have some discomfort in the first 24 hours, but this generally responds well to over the counter pain medications. Most people go back to work within 48 hours. Try not to chew directly on the treated tooth until your permanent crown is placed. Temporary crowns are not as strong as permanent crowns, and it is normal for the tooth to feel sensitive for a few days. Of course, if you experience any unusual symptoms, please call us right away. Call 701-852-4755 to schedule your first appointment.